Loretta Lynn has released the video for the track Lay Me Down, a duet with Willie Nelson, from her new album Full Circle. The song, written by Mark Marchetti, is a poignant reflection on life while contemplating one’s mortality. The video, directed by David McClister, features Lynn and Nelson, each alone, singing the song within the backstage halls and dressing rooms of the Municipal Auditorium in Nashville, TN. Eventually they join each other on stage in the empty auditorium for a heartfelt and intimate meeting of two old friends. The pair have not performed together since Farm Aid in 1985. 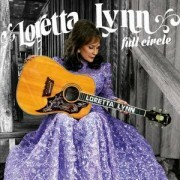 Country legend Loretta Lynn will launch her new album ‘Full Circle’ at SXSW in Austin on March 17. Loretta Lynn will release her first new album in ten years, Full Circle, on March 4 via Legacy Recordings.